Using the infrared eyes of NASA’s Spitzer Space Telescope, astronomers spotted the swirling disk around a pair of stars in the quadruple-star system HD 98800, located 150 light-years away in the constellation TW Hydrae. So-called “circumstellar” disks like the one that rings HD 98800 can be the birthplace of planets. Most disks are smooth and continuous, but Spitzer detected a gap in the HD 98800 disk that could be evidence of one or more immature “protoplanets” carving out lanes in the dust. The researchers spied two separate belts of material in the circumstellar disk. One belt sits at 1.5 to 2 astronomical units (AU) from the binary stars and likely consists of fine dust grains. The other is located about 5.9 AU away from and is probably made up of asteroids or comets. (One AU is equal to the distance between the Earth and the sun.) A swath of near-empty space separates the two belts, inside of which a budding planet might roam. Alternatively, the researchers think the gap could be caused by a gravitational tug-of-war between the system’s four stars. The other two stars are also doubled up, and the two binary pairs are separated by about 50 AU—slightly more than the distance between our sun and Pluto. The stars that make up each stellar doublet orbit around each other, and the two pairs circle one another as well. Worlds with multiple sunsets are not uncommon. Astronomers used to think that strong gravitational forces from multiple stars might interfere with planet formation, but recent surveys have revealed that the dusty debris disks that function like nurseries for new planets are as common around double star systems as they are around single ones. 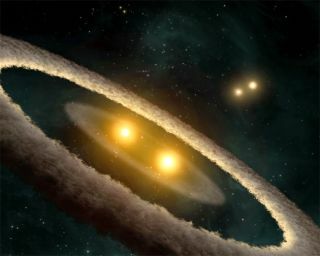 A few triple-star systems are even known. “Since many young stars form in multiple systems, we have to realize that the evolution of disks around them and the possible formation of planetary systems can be way more complicated and perturbed than in a simple case like our solar system,” Furlan said.